An outage in one of the data centers which prevented some people from updating or accessing their contacts.This has been fixed, but contacts added during this outage will unfortunatly be lost and need to be added again. Some back end systems had trouble with the handshaking (technicial term to indicate the communication protocol between systems): Messenger was trying to send a request for the contact list and the response it was getting was't what was expected due to modifications on other back end systems. Exit Messenger completely (this means right clicking the Messenger tray icon and choosing Exit). 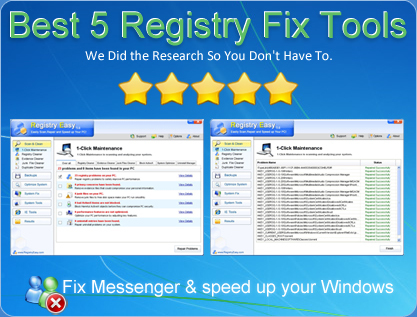 Close your registry editor and restart Messenger.Make sure you don't delete or modify anything else. Wrong alterations can cause serious problems for Windows. Does this also work for the 80072efd error? cos i did it but..
you should save it as blabla.reg ... then run it! i cant sign in to msn messenger i keep getting a error code 800401f3 please can anyone help me? i cannot sign in using my account, but i can with everyother account, i have more than one. its not only on WLM but on every messenger i can think of. i can still access hotmail though. Let me guess... you have hotmail account? You better export all of your contacts and inmport it to gmail account. Anyone who can help is a life saver!!!!!!! I can't sign on with WLM, error code 8004888D keeps coming up. Any suggestions?? i downloaded the thing at the bottom of the instructions and ran it but it didnt do anything the error code is 80040154 what is the problem and how can i sort it out plz help me and thanks for your time. Yay i have been without this for months and found this, Tried everything that was suggested and one of them must have worked because messenger is up and running again. Thank you for this blog, it is really helpful for MSN users. and the error code is 80048823, which is when you enter the wrong password or email and i am sure i put the correct ones but it doesn't work but when i sign in with another account it works. the email account i want to sign in with has a dash in it. could that be the problem? Hi i insalled the msn messenger to my computer but when i press the icon of the msn nothing comes out actually when we press the icon of msn the msn should appear and i can log in but i can't longing cuz nothing appears when i press the icon . I've been trying the advices that shows above but did'nt work. Do have an equivalent piece of advice for someone unable to sign into her MSN account on an Apple Mac? Her siblings can sign on to MSN with this computer, and she can sign on to her MSN on other computers. It works perfectly thks in advance! ok,tis is sooooo freaking annoying to D; there is no error code tah's the same as mine D; mine is "80072745" ~! pls tell me wat to do!!! You are a genious, i have been trying for MONTHS to fix one error and this did it in 2 seconds!!! THANK YOU SO SO MUCH!!!! MAKE SURE THAT YOUR TIME ON THE COMPUTER IS RIGHT!!! THATS WHAT I HAD WRONG!! Hi, may be i can help u all. U all use what version of MSN? Ok listen up i am trying to login And i tried every solution the weird thing is i can login with other emails but not this one is there any explaination for this?? i have the same prob too! i cannot log in with my hotmail account but i can log in with others' using the same laptop. how can i solve this? i've even tried updating my msn to the newest version. MSN won't let me sign in, it just keeps coming up with the same message 'we can't sign you in because the service is temporarily unavailable' the error code it keeps coming up with is 8e5e0125. Please help!!! My msn just wont load, when I go onto the msn homepage and click messenger, it tells me to download it when i already have. Then if it does load, it says error send error report or dont send. Can anyone ttell me what i should do>? in greek: eixa katevasei to msn alla diagrafike mono t kai tora dn mporo na to katevaso...ti prepei na kano? and it will work ! can any one here help me please it wont let me sign into MSN,when i try to sign in it says, "We cant sign you into windows live messenger, your contact list is not available right now, please try again later, error code: 84cc0020!!!!!! I need help.. I can't sign in.. My error code is 8000401a..
Do they required to update ? I can't sign in even though i already updated the msn. im a 13 year old guy and i need help signing in , whenever i try and sign in it says my password or username is incorrect.. please help me!!! Windows Live Communications Platform has encountered a problem and needs to close. We are sorry for the inconvenience. Thanks! So simple and easy. Just a word of note for others, from 8.1 - the current version of MSN, it will be under Microsoft>Windows Live> Shared not under MSNMessenger. I had to restart my laptop because it was playing up. As soon as I had got my laptop working again I downloaded msn messenger again. Msn messenger is ready for me to use but whenever I sign in it doesnt seem to do anything it stays white on the bits where you can choose to be automatically signed in. Please help me. when i sign into msn messenger, it automatically signs itself out. Could someone tell me the reason for this and how can i fix it ? please help me!!!! i have error 84cc0020! already tried to delete contact lists on pc, repair messenger, reinstall - nothing helps!!!!!!!!!! please send me ur advices to olya_at@hotmail.com!!!!!!! "Your contact list is not available right now. Please try again later"
ONLY FOR ONE OF WINDOWS USERS. Won't let me sign in msn. i tried everything and it still doesn't work. if this helps anyone cause it certainly helped me.. I turned off Remember me and not had a problem since. Well I acquiesce in but I about the brief should prepare more info then it has. I have an error 80048823 I've been trying to get into my msn since 2 weeks but it wont let me in even when I put my password,it keeps on saying I have wrong password.Please can you help me? my msn wont come up at all, where i have to sign in. it just comes up with a box saying windows live messenger has encountered a problem and needs to close. the some more writing, with 'send error report' or 'dont send' how do i fix this? Error code: 800488fb. wont sign me in.. help please! I'm good at using forums for fixes, but no one seems to see the same error I have. I'm getting a 80194193 error, which is still saying the ole' "....try again later" message. What can I do!? Anything? I've updated the registry, I've deleted and re-installed...nothing seems to work.